High above the Paseo de la Reforma in Mexico City, standing tall among the trees and buildings that line the street's path, is the majestic Monumento a la Independencia. Tourists and city dwellers alike know it as the Angel of Independence, or simply El Ángel. Cast in bronze and adorned with 24-karat gold, this monument's namesake, “Winged Victoria,” seems to float from the pedestal. A landmark symbol of triumph, freedom and peace, Victoria continues to gather people far and wide in proud remembrance. So, it's no wonder that this work of art has graced Mexico's bullion Libertads since the series began in 1982. And now, for 2019, the Silver Libertad makes its annual return! Like its predecessors, Mexico’s 2019 One-Ounce Silver Libertad coin features the iconic design that pays tribute to the Angel of Independence as well as the tremendous pride that Mexicans have in their country’s rich history. With a cultural legacy that traces back centuries, this 2019 One-Ounce Silver Libertad is the latest in a long line of masterpieces from the Casa de Moneda de Mexico – the world-famous Mexican Mint. You can bring this beautiful coin home struck with razor-sharp details and exquisite designs in a full ounce of 99.9% fine silver. 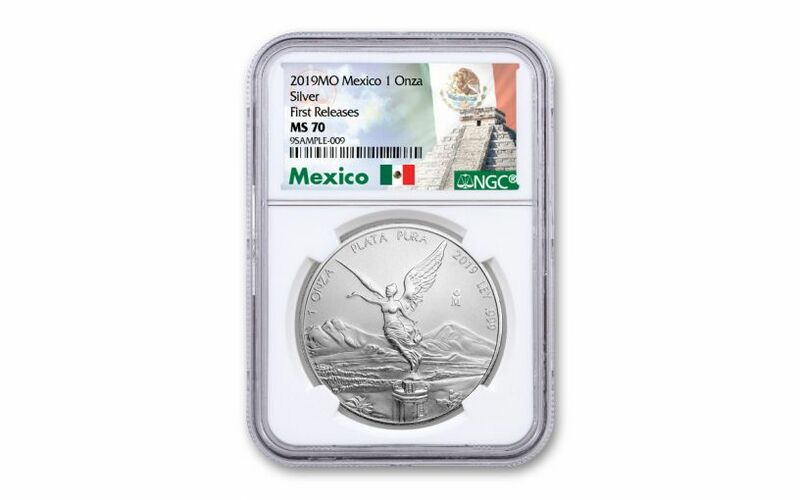 In fact, your 2019 Mexico One-Ounce Silver Libertad has been graded by the Numismatic Guaranty Corporation (NGC) as being in flawless Mint State-70 (MS70) condition, a distinction that means your perfectly-graded coin will have ZERO imperfections – showing all features and fields exactly as the engraver and mint intended. In addition, NGC has graded your Silver Libertad to be a First Releases (FR) coin, a designation that means it was received by NGC or an NGC-approved depository within the first 30 days of its release. It will come sonically sealed in an acrylic holder with a white display core and an exclusive Mexico-themed label. Mexican Libertad coins are prized possessions of collectors for several reasons, not the least of which are the beauty of their designs and their strong ties to the country’s rich history. Whether you have Mexican heritage, a love for Mexico, or simply appreciate the remarkable beauty of this unique series, order this 2019 Mexico One-Ounce Silver Libertad at GovMint.com today! A LYRICAL VISION OF TRIUMPH AND HOPE – Like the ones that came before it, the 2019 Silver Libertad features the winged goddess Victoria hovering over Mexico City with the breathtaking landscape of the country beside her. Victoria is also complimented by both the Popocatépetl and Iztaccihuatl volcanoes – named after the two Aztec lovers of legend. The coin’s obverse features Mexico's National Coat of Arms surrounded by 10 smaller versions of the national seal. STRUCK IN HIGHLY-PURE SILVER – This fabulous Silver Libertad was struck in a full ounce of highly-pure 99.9% silver at the prestigious Mexican Mint (Casa de Mondeda de Mexico), the oldest mint in continuous operation in the Western Hemisphere. MEXICO LEGAL TENDER – The Silver Libertad is Mexico legal tender, with a value that is based on the coin's silver spot market value and quoted daily by the Banco de México – in this case it is 1 Onza (1 ounce). 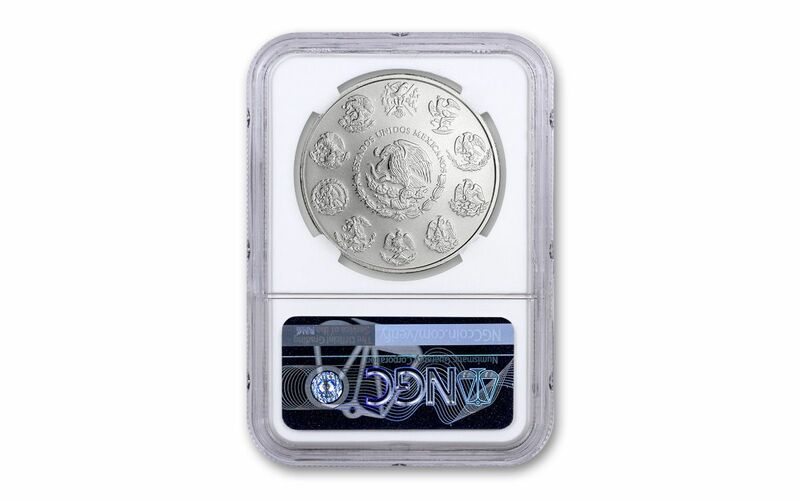 GRADED IN PERFECT UNCIRCULATED CONDITION – Your 2019 Mexico One-Ounce Silver Libertad has been graded by the Numismatic Guaranty Corporation (NGC) as being in flawless Mint State-70 (MS70) condition. KEY FIRST RELEASES CERTIFICATION – NGC has graded your Silver Libertad to be a First Releases (FR) coin. It will come sonically sealed in an acrylic holder with a white display core and an exclusive Mexico-themed label. Because countless collectors clamor for these captivating coins every year, we're anticipating demand to be extremely high. Don't miss out – order yours now!